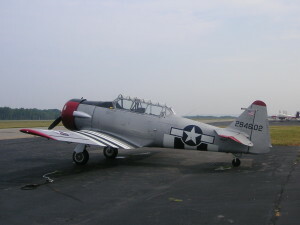 Shortly before noon on March 9, 1943, a North American SNJ-4 Texan, (Bu. No. 26615), was flying over southern Rhode Island on a routine training flight. There were two men aboard; Ensign Robert Foster Crader, age 21, of Gardena, California, and Ensign Robert Francis Wolfe, age 21, of Clinton, Iowa. While over the town of Richmond, Rhode Island, the left wing of the aircraft suddenly folded and broke away which sent the plane into a violent spin. Neither Crader or Wolfe were able to bail out before the plane crashed and burned in the apple orchard of the former Holly Farm, about 400 feet south of the junction of R.I. Route 2 and Heaton Orchard Road. The left wing landed about a mile west of Route 2.